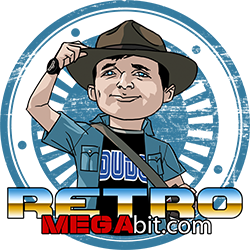 This is not the first time I’ve done some trading with StopXWhispering over at Retro-Video-Gaming. And I’ve learned to get pretty excited about it. Want to see first hand one of the subtle differences between a guy gamer and a girl gamer? 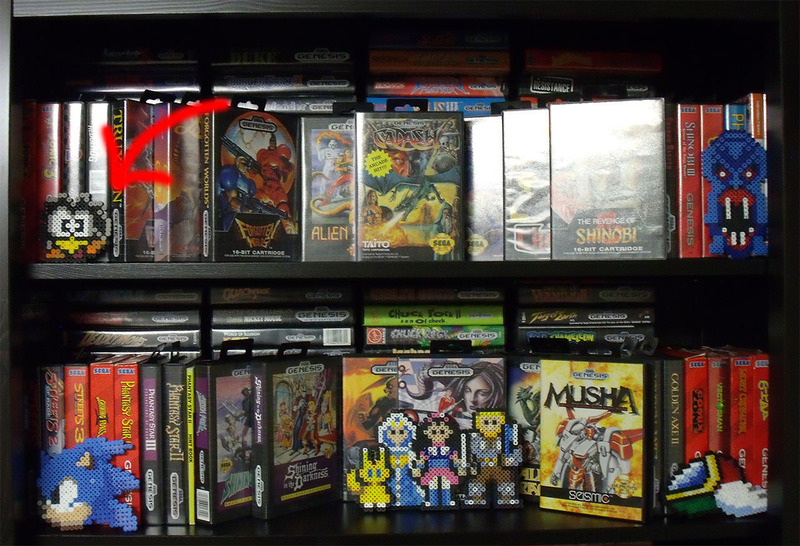 I, The SegaDude, put some games into a box and shipped them to StopXWhispering (I was actually a bite late doing this). 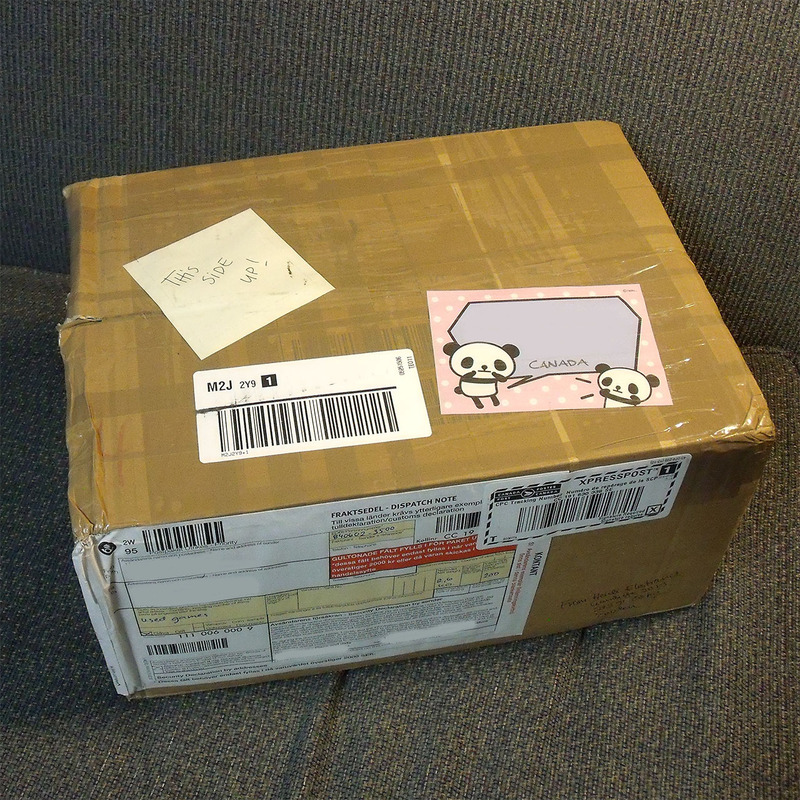 Once we figured out what we were going to trade StopXWhispering had shipped her package of games the very next day. And it was packed full of games as well as genuine bonafide enthusiasm! 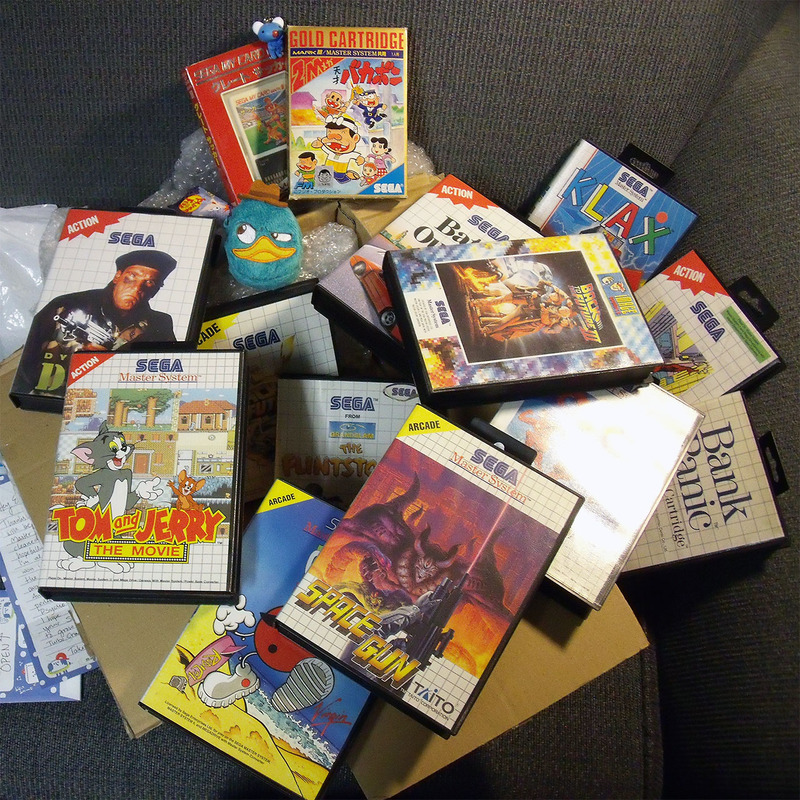 Not only did I get the amazing games that I was expecting but I also got a very nice hand written letter and tons of cool extras… including Sega bags! That’s right, Sega bags. How cool is that?! I don’t know what to do with them yet but they are awesome. 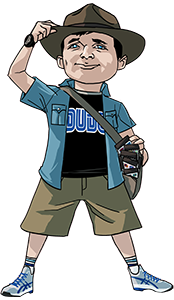 I feel like StopXWhispering traveled into the past when Sega was king and snagged the bags. However, I suspect they might have come from her recent trip to Japan. As soon as I saw the box I knew who it came from 🙂 And upon opening it I discovered a lot of fun extras! 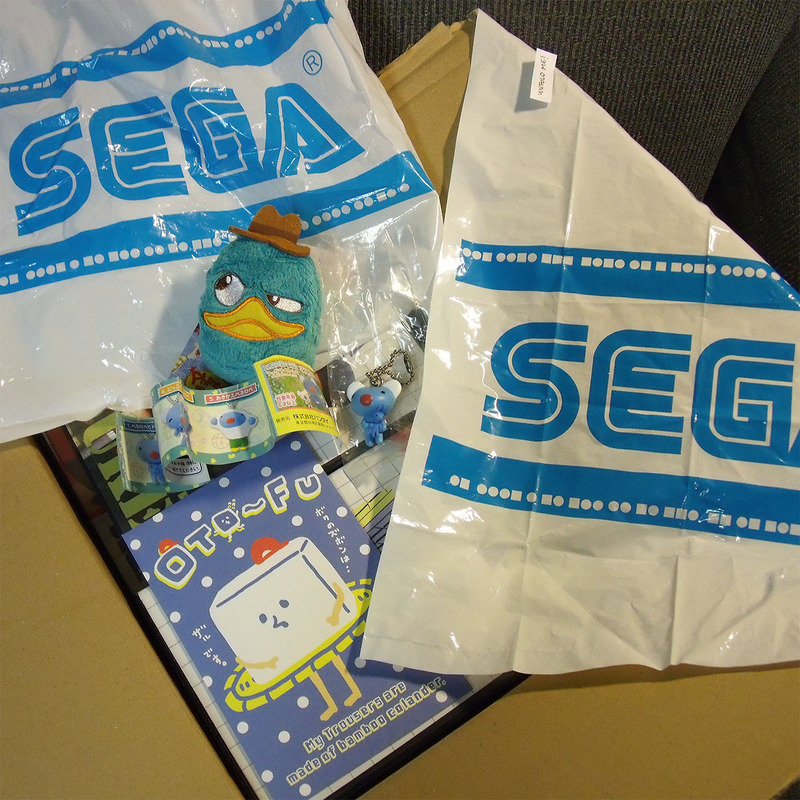 Check out those Sega bags! Japan truly is the video gaming Mecca of the world. 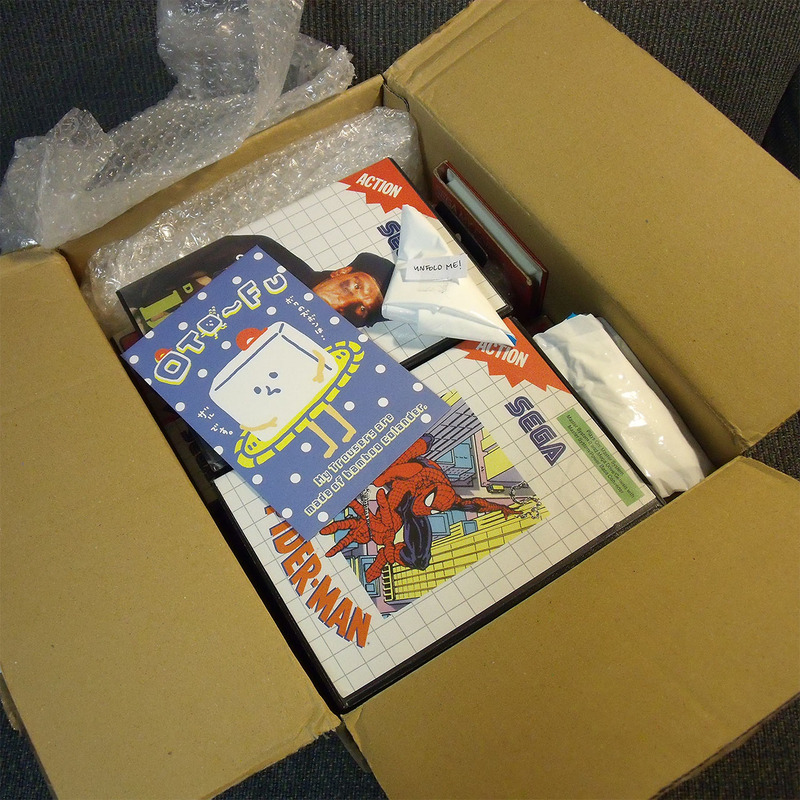 And look at the wealth of games spilling out of this package! It will take me a long time to make gameplay footage for all 12 games so I’m going to post without the videos to show off my new loot. And I’m going to have to follow-up with StopXWhispering to make sure she’s just as happy with the games I have sent her. 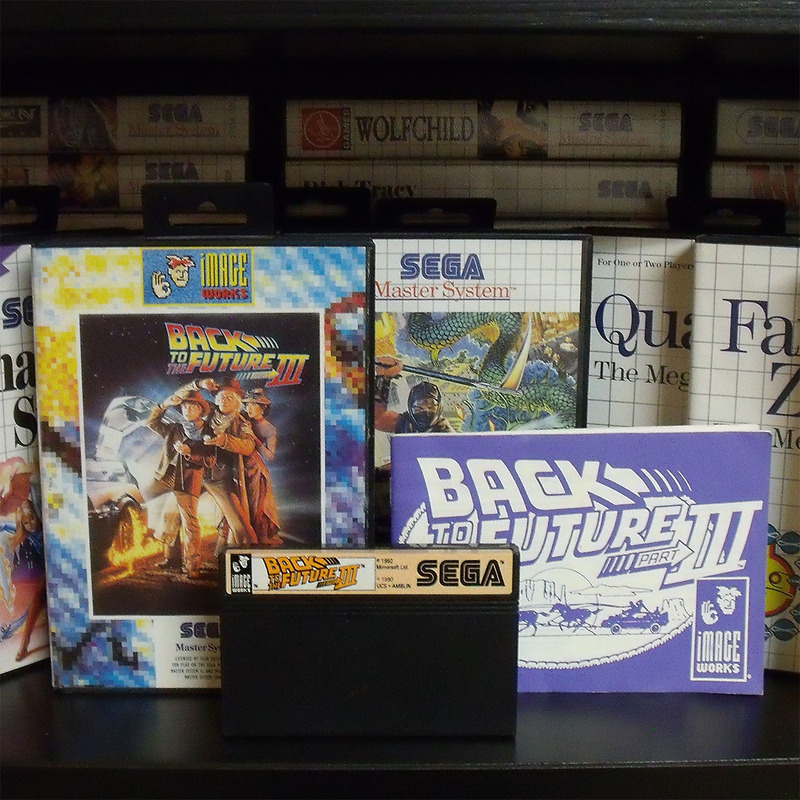 I believe there were only two Back to the Future games for the Sega Master System and now I have them both! They are both complete and in Excellent shape! 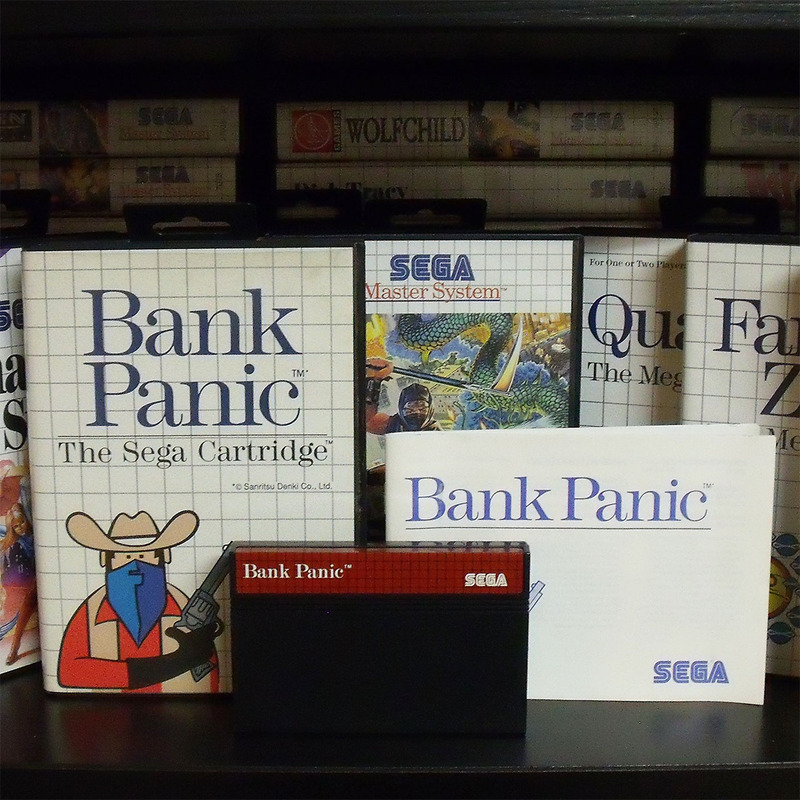 In the late 90’s I had the chance to trade for Bank Panic but for some reason I didn’t believe the guy who told me he had it. We were emailing and there were no pictures and because I hadn’t heard of it before and I didn’t think it was real. I’m normally very trusting and I don’t recall why I hesitated, but I did. Now, well over a decade later StopXWhispering has corrected my mistake! 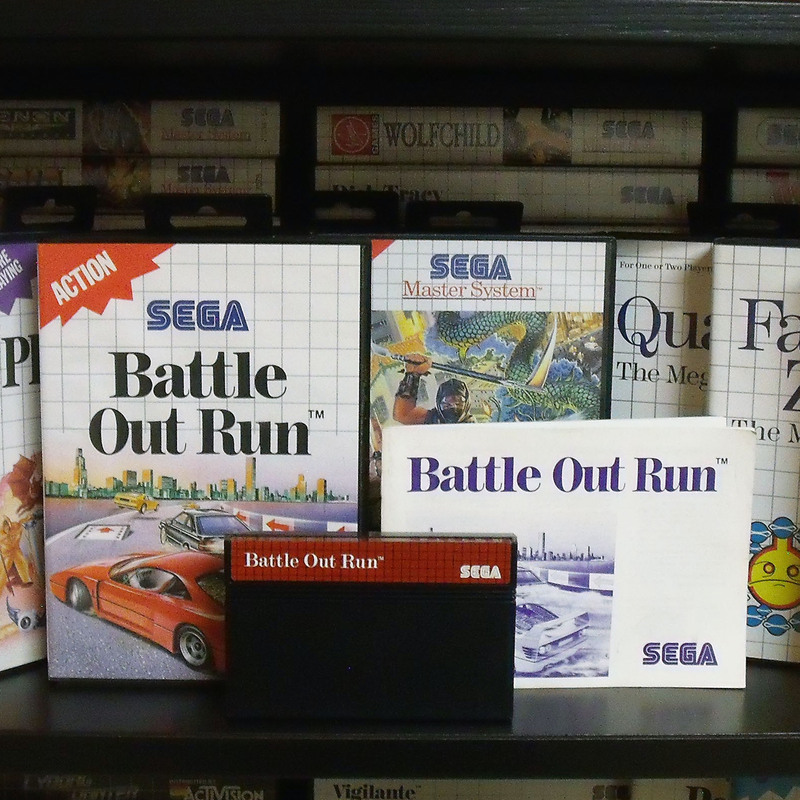 Before the package arrived I had actually forgotten that Battle Out Run was coming and I bought it at a local game shop a few weeks before. Doh! 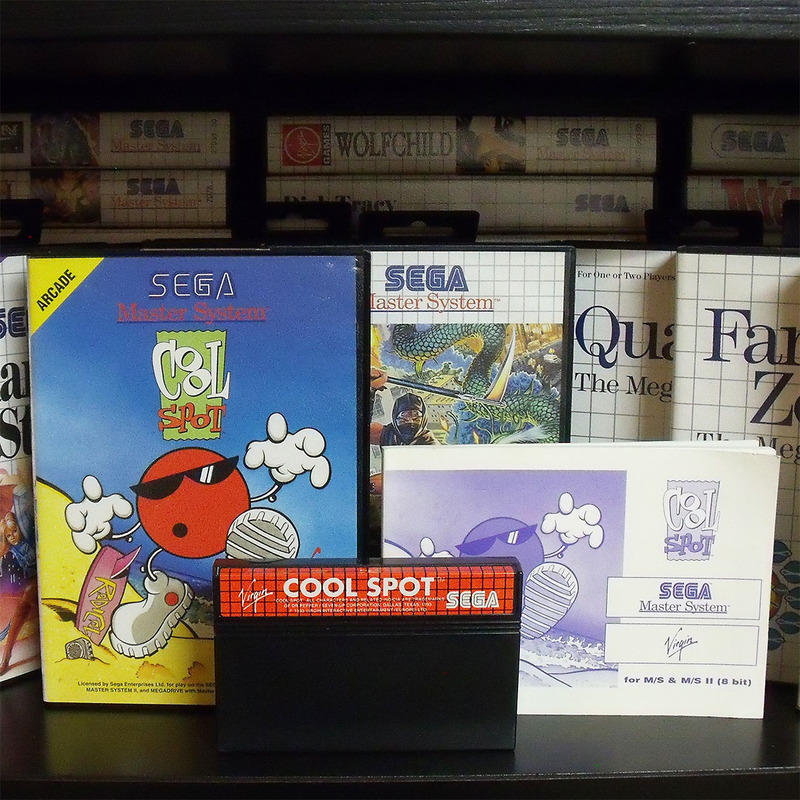 You remember Cool Spot, right? The red spot from your 7-Up bottle. Who knew he’d make for a cool little platformer. Complete and in amazing shape! This is my third copy of Dynamite Duke! 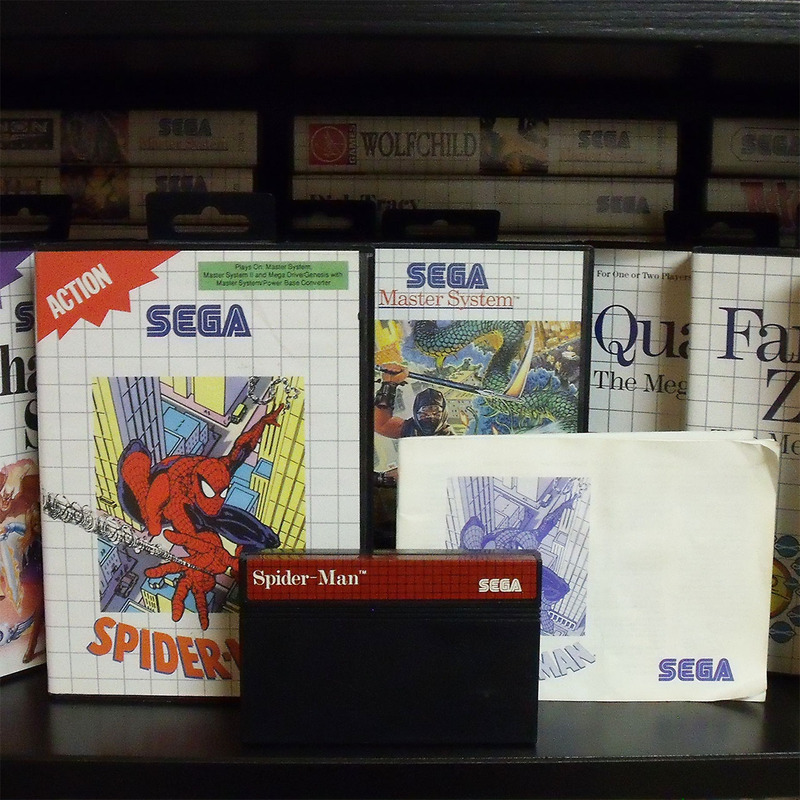 I have it for the Genesis and Japanese Mega Drive and now for the Master System too. If I ever find a fourth version I’ll take it too. Complete and in amazing condition! 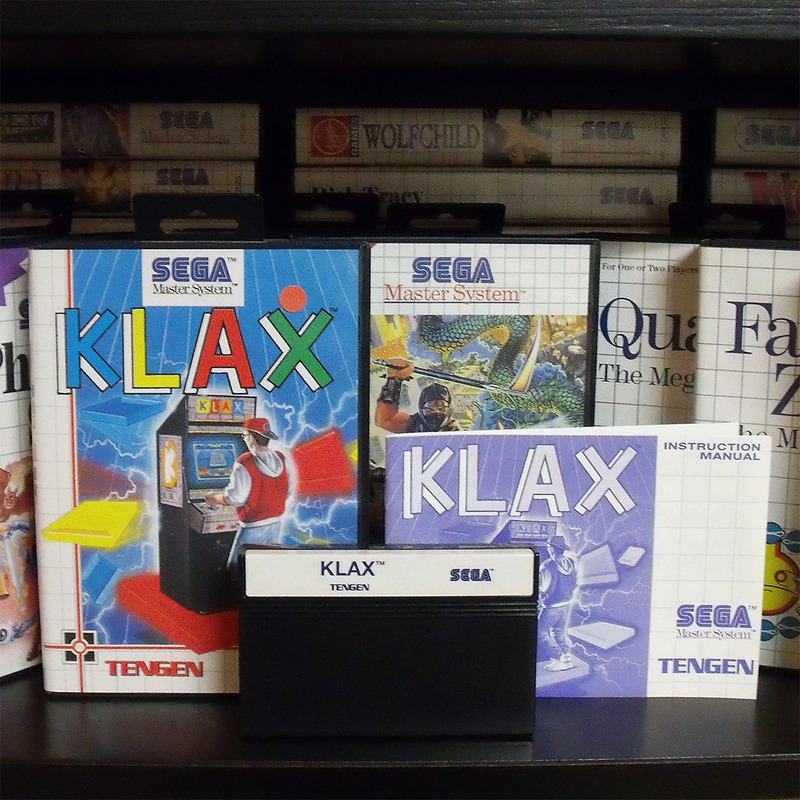 Klax is a fun puzzle game that I’ve played a fair bit on the Genesis. 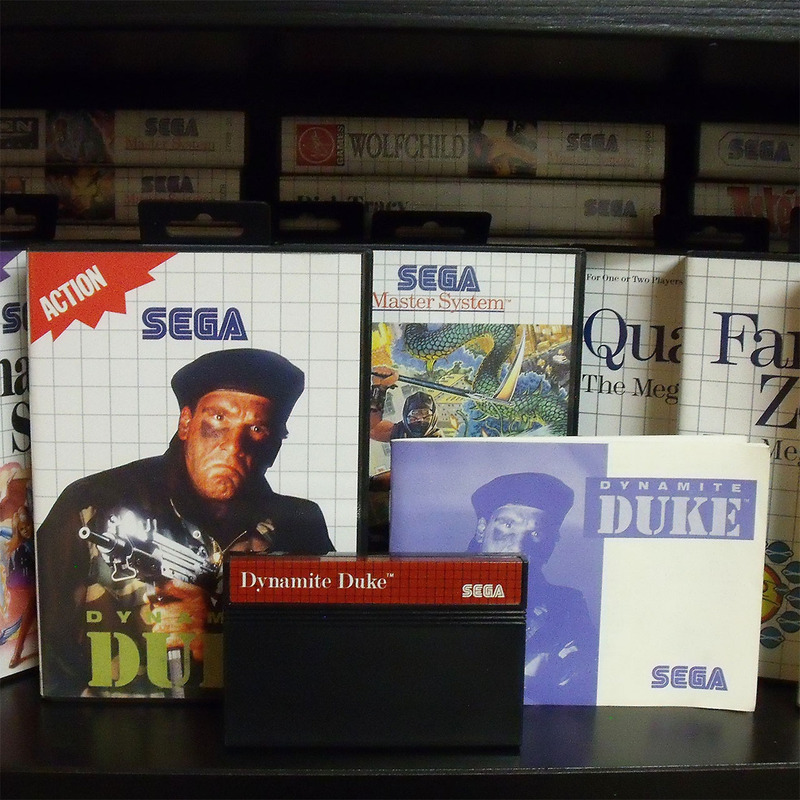 I’m happy to have the Master System version too. Complete and in awesome condition! Take a look at Space Gun. What a great cover! You can play it with the joystick and or Light Phaser and it’s pretty good. Not amazing but fun enough. 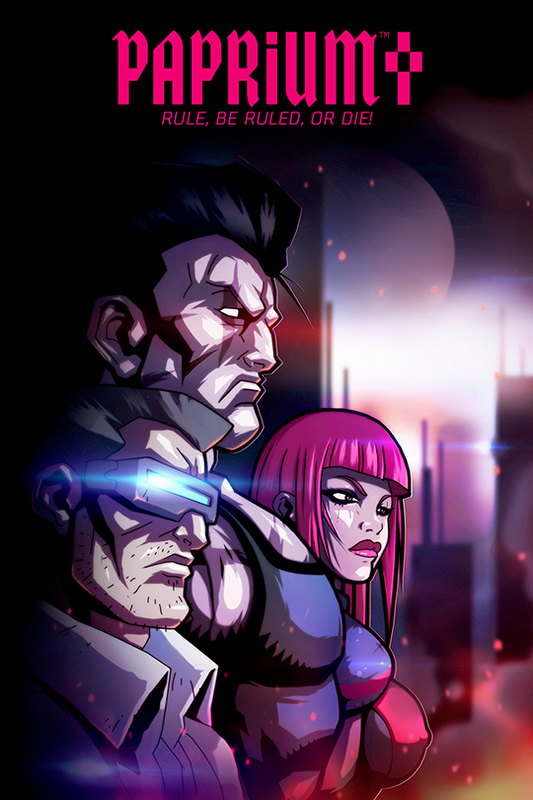 The pace is a bit slow but this is a very cool Light Gun game. I took it for a test run and got to level 5. Turns out my Light Phaser is broken. I had to use the joystick mode. I can’t help but think it would be a lot more fun with the gun. It’s complete and in amazing condition! I haven’t had a chance to try these two out yet. But based on the covers alone I will love adding them to the collection. The condition on these two is not as pristine as the others above but they are still complete and in great shape. Very exciting stuff. 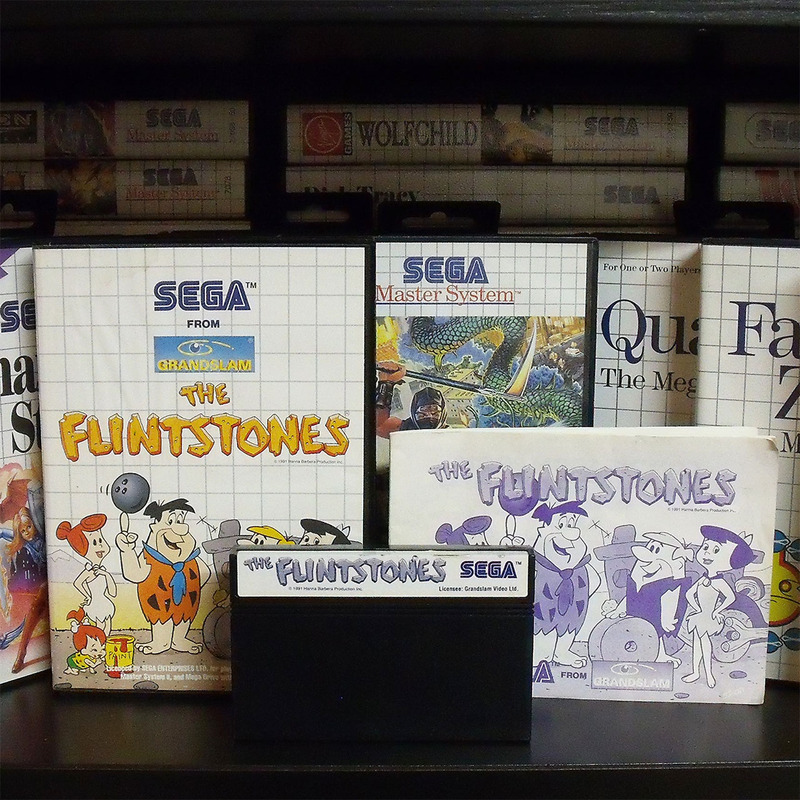 I have the Tectoy version of the Flintstones in OK shape but now I have the PAL version in better shape and complete. The condition is not amazing but it’s certainly good enough. 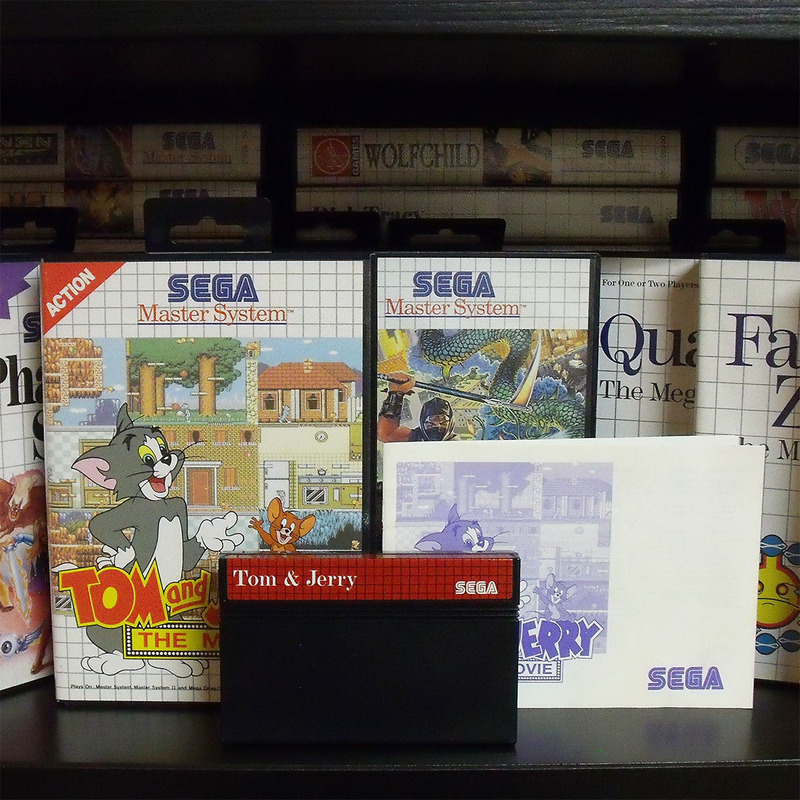 Tom and Jerry is another cool looking game that I haven’t yet had a chance to try out. It’s complete and in amazing condition! I’m actually a little over whelmed with these titles and their condition. I’m really pleased. But it doesn’t stop here. 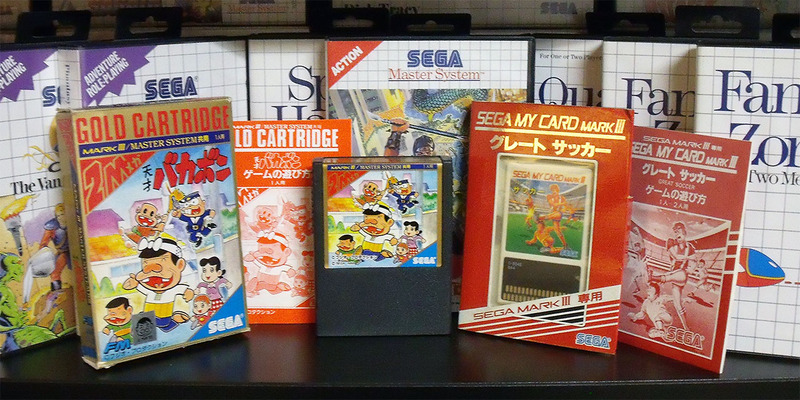 StopXWhispering also got me two Sega Mark III games for my collection. The condition is not perfect but for very old cardboard cases they are in great shape! 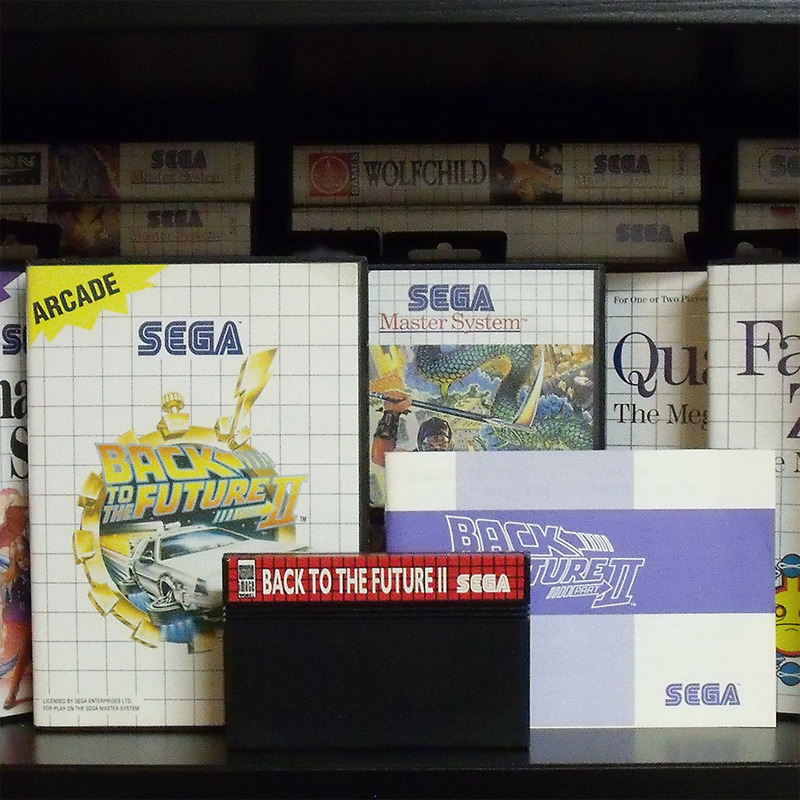 It’s been a very long time since I’ve added to my Sega Mark III collection and I’m now up to 40 boxed games! When I was cleaning up I discovered something that I had over looked and almost threw out. 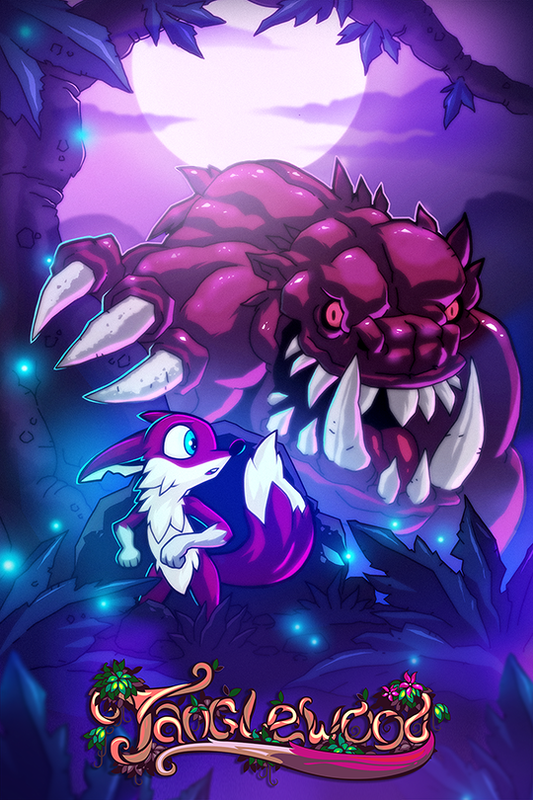 Check out the little black bird side-kick for Psycho Fox. He’s very well done! And I’ve placed him with some of my other Bead Art. 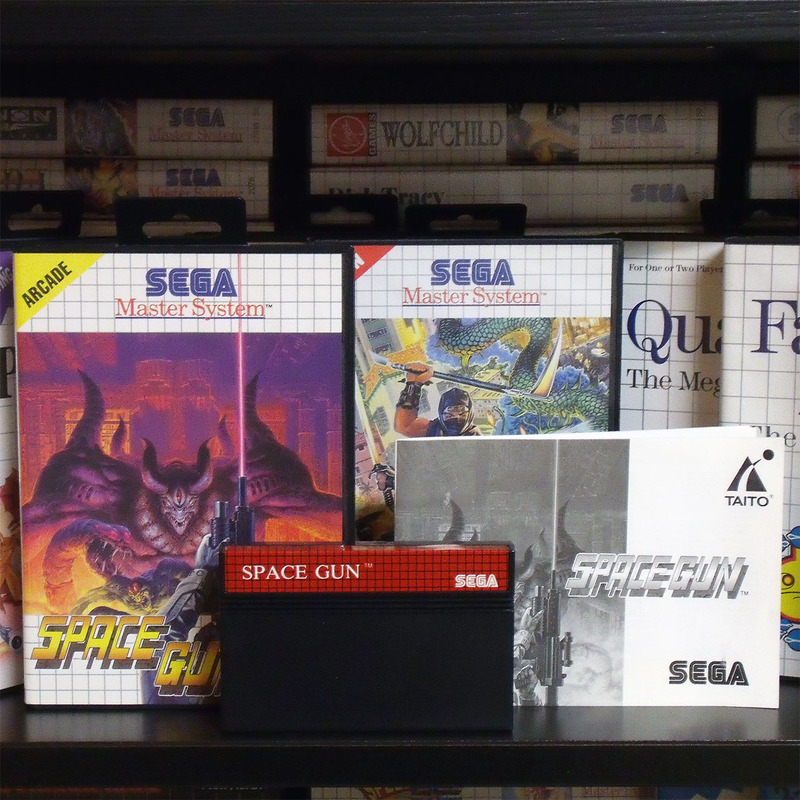 Maybe he should be on one of the Master System Shelves but he nicely completed the symmetry on the Genesis shelves. The Sonic and Opa Opa were also made by and given to me by StopXWhispering. Thank you! Don’t know the little bird? Have a look here. STOPXWHISPERING has posted the games I sent her for this trade. Check out the flip side here. 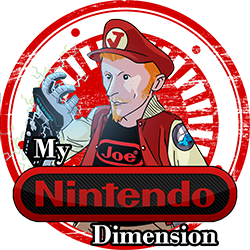 My good friend over at NintendoDimention and I went to a Game Swap this past Sunday. The event was renting tables for $25 and because we had so much stuff we chose this option. In the end I settled on selling Sega Master System games for $10 if they were missing the manual and $15 if they were complete. These weren’t rare or super popular titles but there were definitely some good ones. I did the same for my Sega Genesis games but with a few more exceptions. I ended up selling Phantasy Star II complete with hint guide for $35 and a SNES Zelda (cart only) for $35 as well. All in all, after buying some games and selling some I went home with an extra $220. I also did some trading. I traded four Genesis games (Valis, Light Crusader and two other common titles; all complete) for a Sega 32x with the hookups and 3 carts. If I end up liking my new 32x I’ll be happy with this trade. I was a little uneasy about letting Valis go. I never really wanted to spend $50 or more on a 32x so I thought this was a good way to finally get one for the collection. I picked up ‘AAAHH!! Real Monsters’ and ‘Cool Spot’ both complete and in excellent shape for $5 each. The SNES games were $10 each and the NES were $5 each. The N64 Rogue Sqaudron was free from my buddy 🙂 Thanks! *I’ve gotten a lot of goodies from him. This next trade might sound crazy but I am so very happy with it. 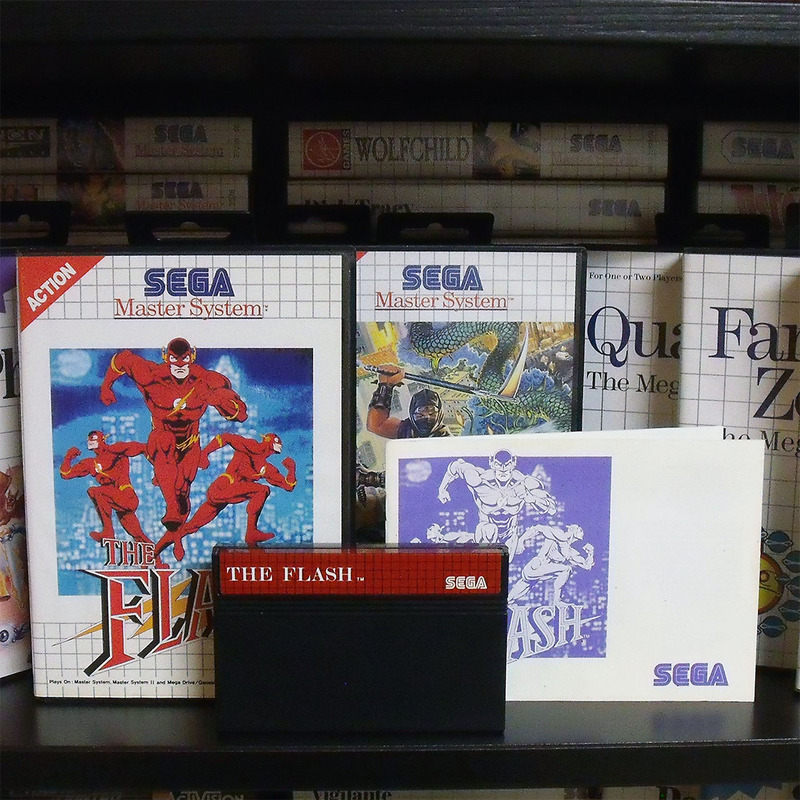 I traded a complete excellent condition Sega Master System in the box for one single Genesis game. Just one! The Punisher. Complete and in excellent condition. *Not really complete. It does not have the tatoo that once came in the box. But I’m OK with that. I think the guy I traded with did well and I’ve had this 2nd boxed Master System for years and I was thrilled to get a game that consistently lists for $100 or more on ebay for no money at all. Sure I spent money on my SMS but if I were to guess I might have paid $30-$40 for it back in the 90’s from a hock shop. Maybe even less I can’t remember. During the day when I first saw Punisher he was selling it for $90 and I offered to pay him $60 if it hadn’t sold by the end of the day. He said he already had the same offer but for $70. So later I suggested he come by my table and see if there was anything he wanted from my stuff. And there you have it 🙂 A very happy SegaDude.